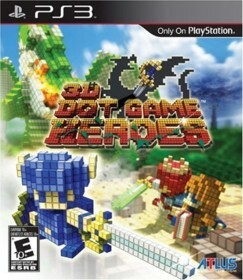 3D Dot Game Heroes is a Playstation 3 game in the RPG genre. The game was published by Atlus and developed by Silicon Studio. The game has an ESRB Rating of E10+ (Everyone 10+) and was released on 2010-05-11. The game's official site can be found at www.3ddotgameheroes.com. 3D Dot Game Heroes is a throwback to the old days of gaming when all that mattered was having fun. Atlus did a great job creating a game that plays very similarly to the original Legend of Zelda for NES while updating the formula for more modern players. All of the graphics in the game are composed of three-dimensional cubes (i.e. "dots"). You also have the ability to create your own character block-by-block if you so choose though several interesting default characters are available as well. The format of the game is simple: enter a temple, defeat monsters while solving each of the rooms puzzles until you locate the boss key which is required to access the boss for that temple, defeat the boss and talk to the temple's "sage". Upon clearing each of the temples you are rewarded a new spell and are given an extra "heart". The sage for the temple then points you towards the next temple. Throughout the game you can fund upgrades such as new swords (which are upgradable at the blacksmith), bows and arrows, bombs, etc.. These new items are introduced at a good pace keeping the game fresh. Additionally, there are several minigames available to the player with the two main ones being dash circuit (a race around a map) and tower defense (a quirky version of popular tower defense games). This game has great replay value. Once cleared, a new difficulty is unlocked which increases the hit points and aggressiveness of the enemies. Luckily, any upgrades you performed to your sword will carry over to this playthrough. Unfortunately, any upgrades to your health and magic will not :(. Once this difficulty is cleared a final mode is unlocked in which you die in one hit. Overall, you could probably spend upwards of 60 hours with this game and not get bored. If you are an older gamer feeling a bit nostalgic about the games of yore or a younger gamer wanting to get a feeling for what games were like "back in the day" you owe it to yourself to check out 3D Dot Game Heroes and experience its amazing bosses for yourself.